I’ve just come back from the House Hotel where I had the privilege of launching this year’s Cuirt Festival, which is being directed by Dani Gill. As I said tonight, it’s a sign of a great festival programme when your first thought is not “what am I going to see?” but “what am I going to have to miss?” That’s certainly my feeling this year: there’s so much to enjoy that it won’t be possible to get to everything. And there’s really a sense that Dani Gill is making her mark: Cuirt is now one of those Festivals where audiences will try things out because they trust the programmer. If you like Irish fiction, there are lots of readings to enjoy – Sebastian Barry, Roddy Doyle and Hugo Hamilton will be there, and so too will three major emerging writers: Eimear McBride, Donal Ryan and Colin Barrett. Ryan’s The Spinning Heart is, to use an appropriate cliche, an instant classic – he has an extraordinary ability to evoke an entire way of life through the creation of vivid narrative voices, and in the process has written one of the best representations of post-Celtic Tiger Ireland – though the book will be read long after the Celtic Tiger has been forgotten, I think. And it’s also clear that McBride is a major talent: truly original and courageous in her use of language and form. There’s also a really interesting young Irish writer called Anakana Schofiel – whose work I haven’t read but who I’m really looking forward to hearing. I’m also looking forward to a great international line-up which includes Patrick De Witt, whose literary Western the Sisters Brothers is one of the most enjoyable books I’ve read in the last few years. 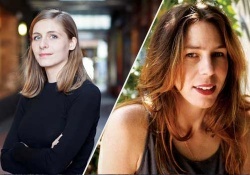 The event I’m most excited about is a double bill featuring Eleanor Catton and Rachel Kushner. Catton won the Booker last year for The Luminaries, a book that has received a lot of attention for its length, and perhaps insufficient attention for all of its other, more interesting, characteristics. It’s amazing to think that it’s only her second novel, and that she’s still in her 20s. I’m looking forward to seeing where she’ll be in ten or twenty years’ time. I’m currently reading Rachel Kushner’s the Flamethrowers, which I am enjoying hugely. It’s about motorbikes and the New York arts scene in the 1970s, and lots of other things. And it’s amazingly vivid: the kind of writing that’s so good you can forget you’re reading. I keep having to pause just to take a moment to enjoy how good it is; it’s one of those books where I want to rush out and buy copies for everyone I know. One other pattern that I mentioned at the launch is that roughly half of the readings this year are by women – which is certainly a greater proportion than we often find at literary festivals. That too is a very positive development, both in terms of giving visibility to emerging authors like McBride, and in terms of inspiring younger writers. As a teacher I’m always very aware of how important it is for students to be able to encounter great artists “in the flesh” – which is why we’re so lucky that we have people like Garry Hynes teaching our students in Drama here at NUI Galway, for example. 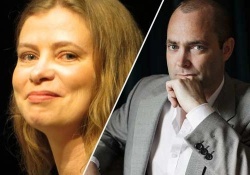 I suspect that for any would-be writers, it will be massively inspiring to see successful young authors like Catton and Kushner in this city. The box office opens later this week, and I’d encourage people to get booking – think it’s going to be a great week for us here in Galway and that events will go quickly.